Qantas launches new ad campaign: "Feels Like Home"
Qantas will unleash a new wave of advertising this weekend, based on the theme of "Feels Like Home." It's the first "brand campaign" since Qantas corporate affairs exec Olivia Wirth took up the marketing mantle in mid-2013, and the airline says it's intended to remind people of that unique feeling of heading home with Qantas. “We often hear that seeing the Qantas red tail at an airport, or stepping on board a Qantas aircraft, makes Australians feel like they’re halfway home already" explained Qantas Group CEO Alan Joyce at the campaign launch in Sydney. "That’s the spirit we wanted to capture." “The stories we're telling through this campaign are repeated everyday across our network" Joyce explained. Wirth says the campaign's mission "is all about rekindling that emotional connection with Qantas that we all know Australians have for the airline." Set to the Randy Newman song Feels Like Home, performed by breakout Aussie singer Martha Marlow, the new advertisements tell the stories of five Qantas passengers and their journey home to Australia, to be welcomed by their loved ones at the airport. Pilbara, WA - Matt (35) from Adelaide, works long shifts at Fortescue Mine in the Pilbara, Western Australia. It’s a long way from home but it all seems worthwhile when he sees his young family rushing to greet him at the airport when he returns. Hong Kong - Melinda (32) and Iker (33) live in Hong Kong and have a small baby, Alexo. Melinda grew up in Sydney and is looking forward to showing him off to his proud grandmother back home in Australia. London – Alice (27) grew up in Adelaide but has lived and worked in London for the three years. She returns home and is greeted by her mum and sister after a long time apart. LA - Charlotte (7) lives in Brisbane and has been holidaying with her grandparents in Los Angeles. Even though she is excited to be travelling on her own, Charlotte loves coming home to be with her mum and dad even more. Santiago - Backpacker Jacob (22) is a chef from Bunbury, WA who has been backpacking, rock climbing and horse riding through Chile for the past few months. He misses his mum’s home cooking and is intrigued to see his younger brother’s new beard. He returns home to see his mum, dad and two brothers. The clips were filmed in Sydney, the Pilbara, London, Santiago, Los Angeles and Hong Kong. You can watch a two-minute montage of the five advertisements below [note: this YouTube clip can be viewed only in Australia]. Qantas says it was "a major logistical exercise to ensure 'real emotion' was captured when the five Australians were surprised by their loved ones in the airport arrival hall", with four different camera setups used to simultaneously film each reunion as they happened. "We believe that this is an opportunity to really tell the stories – and they are authentic stories" Wirth said of the campaign. "This is about five real passengers, five real Qantas customers and our Qantas staff. That authenticity was really important to us." "It is real, it is authentic, and it is important that that genuine experience of homecoming really comes through in these ads. It is about the pull of home." Now that you've seen the clip, read the background and got the context of the campaign, what's your take? Really beautiful ad, hits the spot that they want it it to. I still wouldn't go out of my way to fly QF internationally because of it, but I can see how this will sway people onto the Red Roo. Great ads. I think Olivia Wirth may have watched 'Love Actually' a few too many times and gotten the 'airport reunion' idea from the opening and closing scenes but it's an emotionally effective campaign all the same. Well done Olivia and Qantas! A great TVC. What a great ad. The line about how people see those 'red tails' and how they feel walking onto a Qantas plane on the way home is so true. Very clever of Qantas to tap into it. Im really impressed with this ad. I nearly teared up watching it. Yes it did remind me of 'Love Actually' but effective all the same. Working for the airline myself, I have to say that it makes me feel a certain sense of purpose to my job. People dont realise the stuff that goes on in the background and are quick to put us down when things dont go right for them, but if they saw the effort and energy that goes into each flight and addressing customers requests, needs, wants, they would realise just how hard we all work to bring a result for every single passenger. An ad campaign to be proud of for sure !. Um I spotted two Tigerair planes in the add haha. the 1:00 mark and 1:12 mark too. I love this ad. Personally, I go out of my way to fly Qantas internationally and genuinely get that warm, fuzzy feeling when seeing the Qantas aircraft and crew when flying home. It would have been good to see a little bit more of the red tail in this ad though, but on the whole it's a great ad. Much better than the previous ad of Daniel Johns wailing along with footage of catatonic people and spilt oranges from above! I'm sorry but that was genuinely snooze worthy. Why doesn't QF do something more upbeat rather than try and evoke even more tears from those who actually still travel with them. Even if this ad works emotionally to some degree in it's 2 minute format, it will only look cheesy when it is reduced to a 30 second slot after the first 2 weeks on TV. I give it 2 stars. There is a problem with the video. According to the characters, Charlotte who is suppose to fly from LAX to BNE (I can't imagine a 7 year old trying to transit from international to domestic in SYD or MEL, especially after a 14hr flight), and she is staring at an A380 at the gate. QANTAS DOESN'T FLY A380 TO BNE!!! C'mon, QANTAS! Give us A380 to BNE! Don't forget what your Q stands for! At the same time, plz upgrade your international lounge in BNE! Here Here, couldnt agree more, Brisbane second rate..!! The theme works, but I don't like the execution. Its just a bit mopey, a bit propaganda-ery. I must admit to being converted already as l flew CX and SQ whilst living in Asia for 7 years but always boarded a QF flight home for that exact reason. Interesting - seems like they have recognised that they've cut so much it has affected the brand and remedial action is needed. Nice looking ad although pretty generic concept that many airlines have used. I say they should bring back the old The Way we do the Things we do Commercials of the Australian Airlines era a few years before the merger took place. This must be aimed at the leisure market or first time travellers. Regular travellers got over Qantas a long time ago and their emotional response to this is likely to be negative not positive, especially since AJ grounded the airline worldwide. A waste of money. Haha I thought I would see a post about AJ. It was just a matter of time. If you are going to fly internationally from Australia & return, I can't image a TV advert is going to figure highly in your decision as to which airline to use. This ad is meant to resonate with those who identify themselves as Australians, so I'd doubt it would very much have the same effect to a person of Chinese/British/Chilean descent. Really? So why aren't any of the passengers in the advert aboriginal? Or do you have a rather quaint definition for Australians? Pass me a sick bag. truly how warm mushy and sloppy can it get? Great apperiant, thats about it! It's obvious pandering to the masses.Tug hard enough on the collective heartstrings and the tears will follow. This is not a Qantas bashing, more of a point about AJ. Ever since he took over I feel as though Qantas has been lacking in its marketing and advertising. He's a very clever man no doubt with his mathematical/coding/algor background, however, I feel as though he and Qantas as a whole have been somewhat out of touch with Australians in recent years, Australians have been unable to relate to Qantas. The shrinking of the business, including job and route slashing, have not helped of course, but I do think much of this has been down to several recent failed advertising campaigns, which ultimately are a reflection of leadership. Returning the business back to profitabilty, which seems reasonably likely at this stage, will go some way to restoring the image of Qantas that Australians see, however, I feel as though this ad also goes some way to getting its advertising/marketing back on track, and getting back in touch with Australians. Good to see. Nice advertising. Just need to back it up with better customer service or it is a waste of money and effort. Great Ad Qantas! Way to GO!!! I really like this ad, would have liked to have seen a little more of the QF product, none the less, I think they are on a winner with this campaign. I think it's showing that QF are starting to really get their mojo back, new interiors in the A330's, better IFE and meals, it all adds up to Australia's best offering IMHO. Well done QF. A commercial aimed at Aussies overseas that is unable to be viewed by Aussies overseas. "Feels Like Home" as long as home is not Perth, Adelaide or Brisbane, where it "Feels Like Emirates"
I agree.Brisbane only has HONG KONG,LOS ANGELES AND SINGAPORE services now and the other two are now domestic only ports. I'm waiting for the Chaser's spoof where the protagonist is at the airport gallery looking at the Qantas tail fin, then looking a bit miffed boarding an Emirates flight because they didn't realise it's a code share! Qantas seems to moving in the right direction finally with its marketing. In previous ads they've either made the focus on Qantas staff being glamourous or else plopped a lot of generic images of Australia or other non-specific things together into a package - questionable choices at best. This new ad takes the right path by making customers its focus, and about what's important to them (getting home). Yes, it's been done before, and punchier too by BA, but it's a move finally in the right direction. Qantas need to distill this down into a more compact format, put a bit more product in, and amplify the emotional themes a bit more, but it's a welcome start. Keep pushing forward Qantas. Looking forward to the following individual family story ads :-) especially ours !! Whatever the views of many on this board I am still happy to see that big roo on the back of the plane. Usually from LHR, Dbx and LAX. 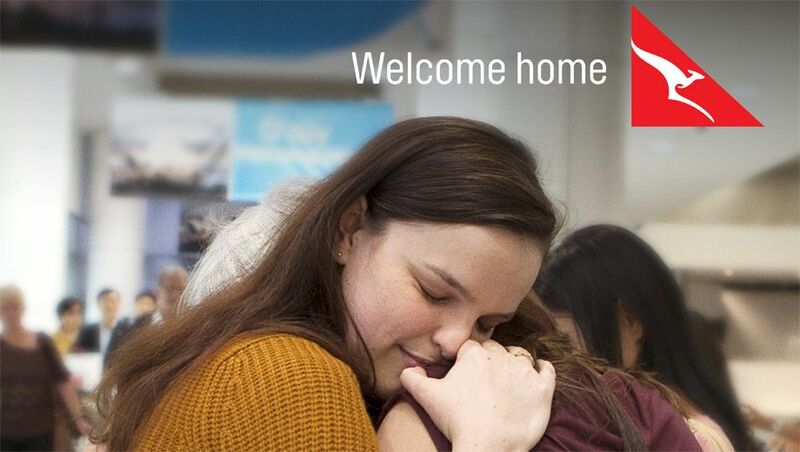 Comment on "Qantas launches new ad campaign: "Feels Like Home""